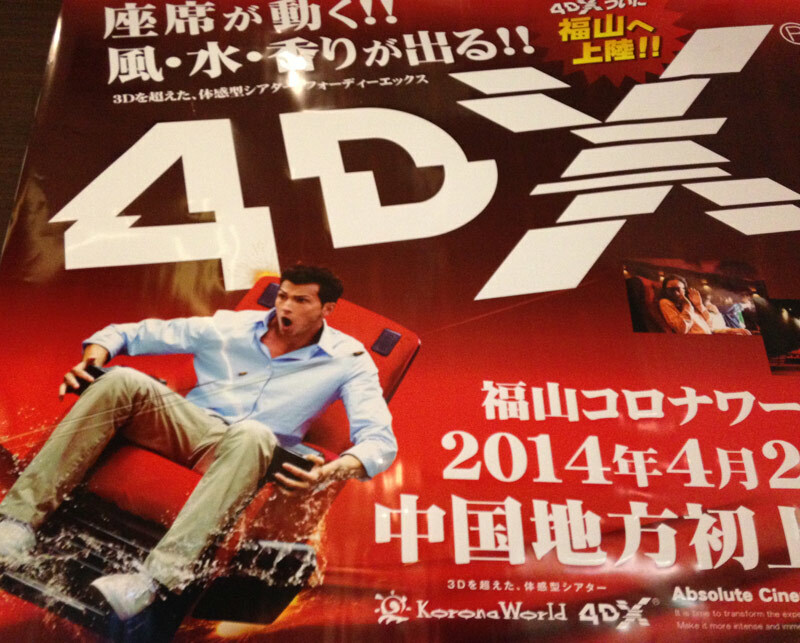 So I got a chance to experience “4DX” Spider Man 2 at our local movie theatre. Despite buying tickets online weeks in advance, I still got a horrible seat. (front, far left) Sadly, this sort of makes the 3D effect worse and introduces eye strain. So what does paying extra for the “4DX” experience get you? What do these fancy electronic chairs do? Well, they mostly kick your chair throughout the movie, punctuated by an occasionally spitting on you. Shoot, back in Salem, Oregon, you got this for free. Every time a “chair effect” kicked in, I was mentally pulled away from the film, it actually detracted from the movie. I realize theatres need to add value to remain relevant but.. I don’t think this is working. What I’d like is a seat perfectly in the middle, be able to pause to use the restroom, and eat and drink anything I want. No commercials or waiting. So yes, I want my living room. This entry was posted in Japan, Reviews on May 10, 2014 by Seth. More and more, theaters are reverting to the 1950’s with Cinemagic and Life-Like 3D and Smell-O-Vision and Sensurround and Spine Tingling Chills. I didn’t even appreciate the 3D in Gravity, and if that movie can’t make it matter (for me), it’s not happening. Gimme 2D pictures. https://www.moviefanfare.com/movie-list/the-five-best-movie-gimmicks/ <–electric shock seats are coming next! Sounds like fun. The only thing it’s missing is a spring-loaded boxing glove that punches you in the face! Sounds like way more of a headache than it’s worth. …Then again, I feel overstimulated with 3D glasses, so perhaps I shouldn’t judge the enjoyment of this.